Ronnie Simpson and Ed McCoy have crossed the 200 mile mark in their tip-toe journey home to San Francisco Bay after losing the keel from the 30-foot sloop, Warrior’s Wish. It’s not as though either of them has had a “night’s sleep” since, living in the cockpit with life raft and ditch bag at the ready. “One more night down and hopefully only two more nights to go. The nights freak me out a bit more than the days. Things are still more or less OK aboard Warrior’s Wish. We’ve had to bleed the motor several times. We checked all of our work regarding fuel filter swap, previous bleeding, etc. Everything seems tight, but due to constant vibration (or something) it seems there is a very small air leak. Motor sounds very starved and loses power for a few minutes. Definitely seems like a fuel issue. The starvation/power loss either works itself out naturally in five minutes, as it did once yesterday, or requires bleeding, which we’ve done three times in the past two days. The motor generally stays running throughout the entire ordeal. She’s purring right along right now and we’re making 5.5 knots with the jib up. Definitely looking forward to getting back to San Francisco. I think we both want showers, Thai curry chicken, and beer. This is Warrior’s Wish doing what it could do when it still had a keel. If you are new to the Ronnie Simpson story, understand that he has had more drama in his young life than most people experience in a long life. 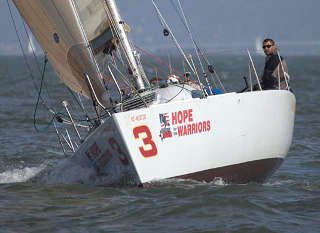 Enlisted in the Marines at 18, blown up in a firefight outside Fallujah at 19, medically retired at 20, off to sail around the world, lost his boat at sea, finished the circumnavigation on a bicycle and entered the 2010 Singlehanded Transpac to call attention to the work of Hope for the Warriors, a nonprofit aimed at getting wounded veterans back into the stream of life. I love this guy, but he does seem like a bit of a lightning rod . . .